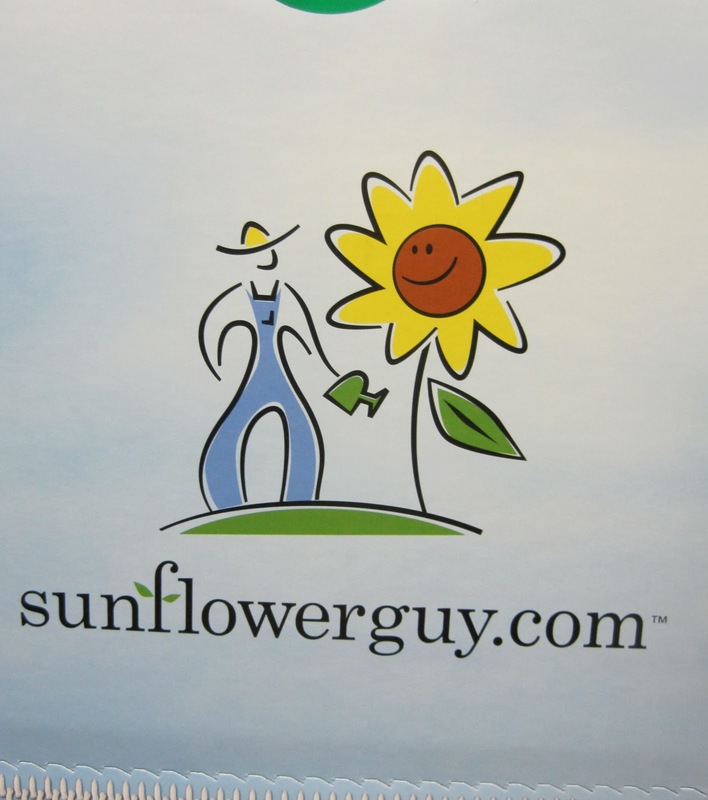 And someone who calls himself SunflowerGuy sends you an email offering the chance to receive a bouquet of fresh flowers to review, you can't help but say "yes". When the box arrives at work a few days later, more than a few co-workers were curious about it, eager to see what was inside it. After all, it is not every day that a colorful box of flowers arrives in the office mixed in with all the white and brown boxes that we seem to get regularly. I took the box home and followed the instructions, which were pretty clear. From somewhere in southern California to my house via overnight flower delivery. These flowers came from Sunflowerguy.com and arrived in pretty good shape, considering the cold weather they traveled in to get here. It's mixed bouquet featuring sunflowers, of course, and roses. "For the most part, the flowers you get from us are “grower direct”. We grow all of our own sunflowers and much of our filler greens. We do get some flowers from other, mostly local source. Our bouquets feature a lot of sunflowers. We are the largest (through our parent company Dos Gringos) grower of ornamental sunflowers in the world. Our bouquets are all designed by floral designer René van Rems. 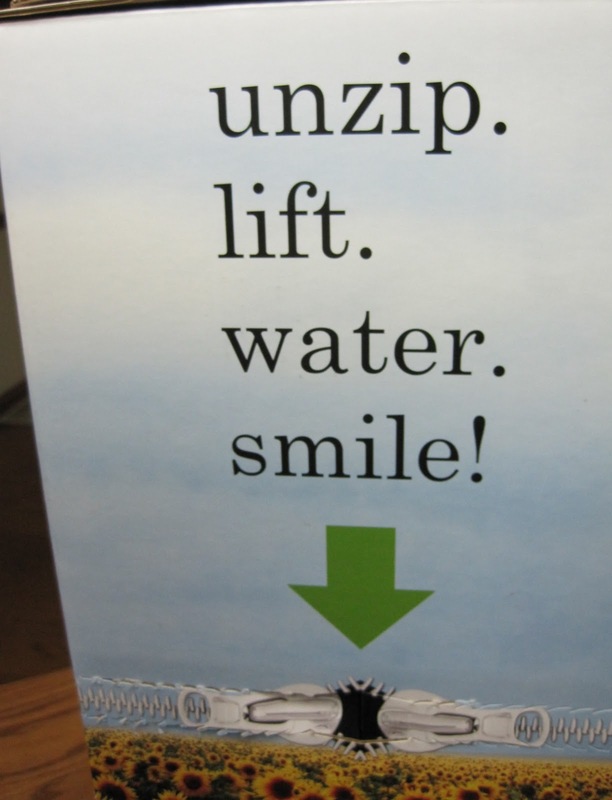 The thing that is probably most unique about our business is our shipping container. We think it is superior to any other flower shipping method. 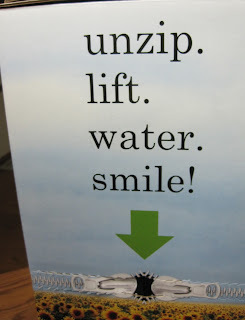 It keeps the flowers hydrated, and prevents the bouquet from being crushed or damaged in any way. Our competitors simple pack flowers into a narrow box, which works if you’re a florist, but most consumers don’t want to have to cleanup, cut and rearrange their flowers." Would you like to receive your own bouquet of flowers from Sunflowerguy to brighten up your house on a cold wintry day. If yes, then leave a comment below telling us about your weather and why you need fresh flowers "Right Now". Hurry, contest ends on Tuesday, Dec. 28th at 9:00 pm. Winner will be chosen by random drawing after that! Update 12/28/2010 -- The winner is Commonweeder! Congrats and enjoy the bouquet. Crazy weather here, Carol! Many inches of snow, frigid winds, snow sculptures, sledding. Not the usual for the Southeast! Blizzard watch in effect. Nothing but white to see. See the flowers asap. They look delightful. over 6 feet of snow before winter...more weekly....frigid temps...we are known for our gray winter days in the Syracuse, NY area as well as 150-200 inches if snow....so I won't see green or any color until April....sunflowers are a fav of mine and would remind me of my meadow!! I need some fresh flowers right now as I live in Florida and although we don't have snow, it's a cold, cloudy and damp 34 degrees! The weather here in Chicago is snowy, grey and way too cold! So a bouquet of beautiful sunflowers would surely make me smile and brighten up my day! I need fresh flowers to make me smile! It's always kind of a let down when all of this Holiday hustle bustle is over! Beautiful bouquet of sunshine into your cold cold cold winterty wonderland! Melt any heart to see those lovely flowers delivered to your dooor steps! Cheers! Well it's a high of 25 today so this would really hit the spot. I'm stuck in Alabama due to snow but hoping to get home to North Carolina tomorrow, where I'm also hoping that there will be power and that I don't have to hike more than 3/4 of a mile to the house through 10 inches of snow because I know the Dept of Transportation won't plow the road for days. And regardless of the power situation, I'll then need to haul firewood through the snow to get the wood stove going. A lovely bouquet of flowers would certainly brighten things up! It's 28 degrees here, 15 if you factor in the wind chill, and we have over 2 inches of snow on the ground. This seems like it has been the coldest December ever and a beautiful bouquet of sunflowers would certainly brighten up our house. It's cold and I really need those flowers because if u select my name on the 28th and the overnight them on the 29th they'll arrive on my birthday! And anyone with a birthday that galls between Christmas and New Years understands exactly why I NEED those flowers! Because it's December in the northern latitudes. It's dark by four o'clock, and gray all day before that. It's snowing in rural Youngsville, NC. The snow started last night and as of yet ot has not stopped.We southerners are not used to all this white and I could really use a spot of indoor sunshine. I live in NJ and we're about to get at least 12 inches (or more) of snow! I'[d love to win this! Thanks for the pretty giveaway. I'm really bummed because we aren't getting any snow. If we lived just an hour east, we'd be getting at least 6". I could use some fresh flowers since I wanted a white Christmas and didn't get it. It's snowing here right now and the wind is howling...we're expecting some 14" between today and tomorrow. What I really hate is my husband goes into work at midnight tonight and I get so worried about him driving and then he'll come home tomorrow to having to shovel. We hate winter! A nice bright sunny bouqet of flowers would brighten up our cold and snowy days. I'm in Dayton where it's been snowing lightly all day. It's really kind of pretty, but they are predicting warmer weather and rain later this week. All the snow will melt and we'll have nothing but rain and mud. I know I am going to need some cheering up tomorrow when we get home after being away a month. During the time we have been gone the temperatures at home were not a bit like I wanted them to be when I was away... cold, damp sunless, so that the plants in the greenhouse and potting shed would not suffer. Instead they were even verging on hot with nary a drop of rain. We turned off the water to the house just in case of cold weather. I suspect my garden will look dry and brown. Yes, I think I will need some cheering up and a bouquet of flowers is just what a gardener would want. Blizzard watch here too. We don't actually have much happening here on our hill right now, but the threat has cancelled my Texas daughter's flight up here today to Massachusetts, and even tomorrow's flights. She said if she can't get a flight on Tuesday she'll have to give up this trip. Talk about a day without sunshine! 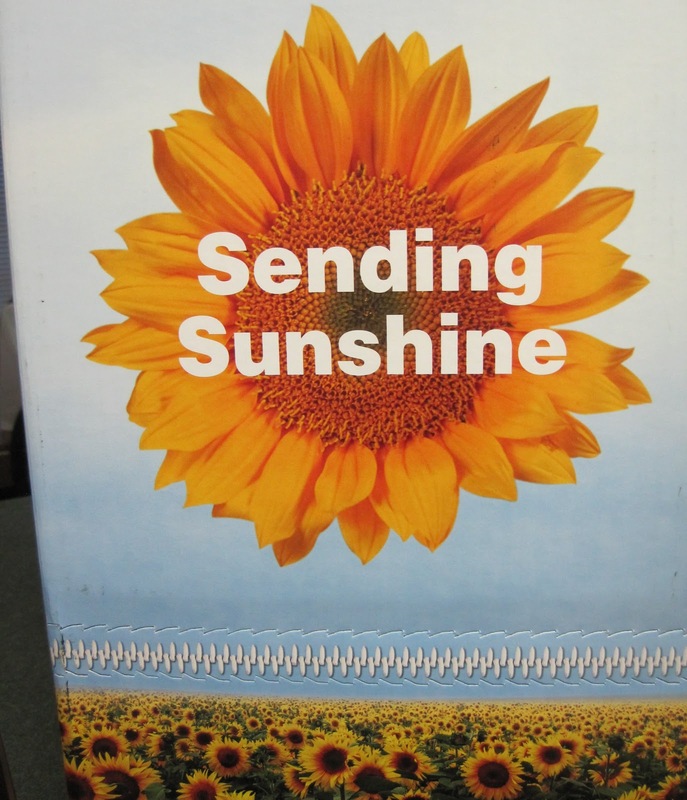 We need sunny Kate - and maybe sunflowers, too. Because I'm in North Florida and it snowed today! Just barely, but snow it did..I posted it so you who receive 'real' snow can get a laugh or two. The December blizzard is just starting here in Boston and I know I am going to need something sunny and bright to remind myself that all the white, gray, cold will be gone in just a few months. Sunflowers really speak of late summer and August which makes me warm just to think about it - I am sure it would work even better if I actually had the flowers! It is cold and snowing right now so some fresh flowers would be great. You know where I am, and you know what my weather is like so I can't pretend that's why I need them! I think the bouquet would make my mother very happy, though. This basket of sunshine I wouod send to my mom.Oh the weather outside is frightful let it snow let it snow let it snow. I need fresh flowers to make me smile! 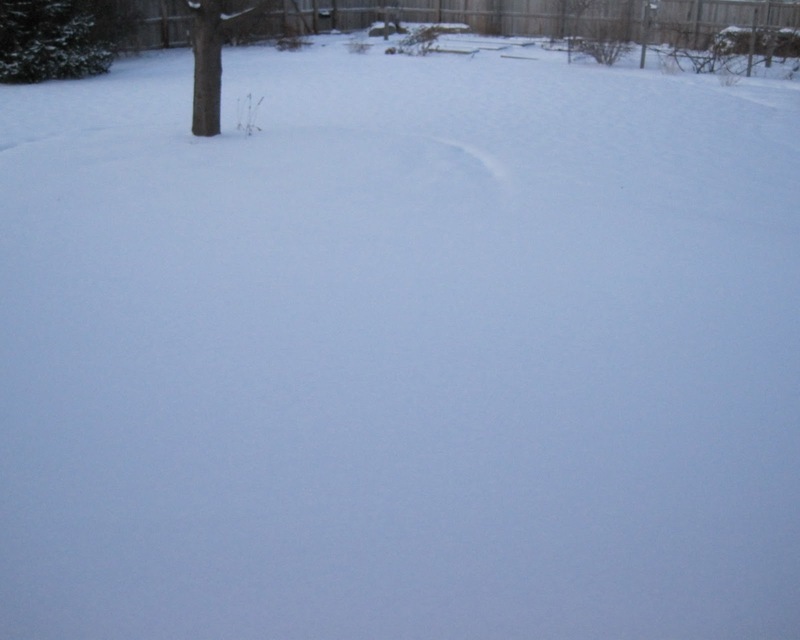 Snow on the ground here - it doesn't have to be measured in feet. My thought is anything over 1 inch is too much. Why didn't the drought continue through the winter like it did through the summer? Just cold and wet here. And windy. Could be worse, but I'd still love the flowers! HELP!!!!!!!!!!! I need flowers & sunshine. It's been grey cloudy and if you can believe it snowy here. To top it off we lost electricity Christmas Eve in the middle of the night. Maybe Santa accidentally tripped the fuse. It is the day after Christmas and it has snowed all day. It is beautiful outside. A blanket of snow covers the ground,snow is nestled on the green branches of the pine trees and the bare branches of the other trees. What a beautiful day! We are so fortunate that we've not had a lot of snow this year but we have had more than our fair share of bone chilling cold and gray, gray days. So the flowers would be a ray of sunshine. It is cold and rainey and I would love to have some brightness with fresh flowers. I'd like the flowers because even though we don't have snow yet, it's stinking cold outside and most of the pretty flowers have gone to sleep for the winter. We drove about 4 hours today to escape rain, to enjoy a snowy cabin for New Years. I'm in Canada, so not eligible, but perhaps could send the flowers to my sister in the U.S. 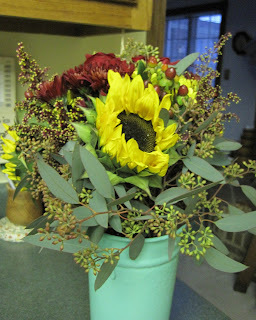 The sunflower arrangement would be very cheery, especially in winter. It is cold and snowy here in southwestern Ohio. Sunflowers are one of my favorite flowers and always remind me of happy and bright moments. I would love a little floral sunhine! My weather, snowy, windy and cold. Not a flower to be seen. Looking at flowers would do so much to help warm me up. It is so cold here and gloomy out. Would love recieving fresh flowers! Love reading your blog and will keep the website for future ordering. It's winter in Minnesota, that's probably all I need to say...but it's been worse than usual so far. Tons of snow and below zero temps and it's only Dec. It's going to be a looooong winter here and a nice fresh bouquet of flowers would be fantastic! the weather here is cold about 25 out and 8 inches of snow on the ground.i would love to win because i have horrible morning sickness and feel awful, i'm sure fresh flowers would help my mood a little. I have to admit that life is pretty good right now and the sunflowers would just reflect my positive mood. 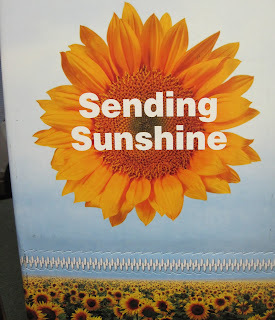 Being that I'm just now emerging from sickness over the holidays and facing a messy house and a temperature outside of 20 degrees, I could sure use a little sunshiny sunflowery cheer! Living in Seattle it is raining about 6 days a week and gray outside. I need some sunshine!! It is so cold and windy. Below zero weather and waiting for winter to end even though it has just began. Over Christmas weekend we have had rain, sleet, freezing rain and snow. We need flowers to keep us from getting the winter blues. Thanks for the contest. It's really cold, snowy, and dark here, so a sunflower bouquet would brighten things up! But we both so miss the flowers and greenery. Although we are both of partial Swedish decent, and have a reasonable tolerance of the cold weather - we both get kind of depressed this time of year, when the days are so short and the nights are so so long. Flowers, especially sunflowers always make everything seem brighter! Winning this bouquet would really make our day! It's 18 degrees and about 2 feet of snow on the ground. We've had fog all day. This would be so nice. The newsman just said its the second coldest December on record here in southern Ohio, so these would be greatly appreciated. I live in North Dakota so normally it is cold this time of year, but this year has been even colder than normal and we have tons of snow...so we would love a little sunshine right now! We got hit with a ton of snow this weekend. The roads are icy. It's supposed to get above freezing tomorrow so maybe some of this will melt.Some flowers an green would be so cheery. Wow, I almost missed this! The weather here was cold cold cold this morning, but it warmed up nicely this afternoon, actually got above freezing. I need fresh flowers "Right Now" because I always need fresh flowers! Doesn't everybody? Besides, my poinsettias are starting to look a little sad since there really isn't enough light here. I could use some fresh flowers right now for several reasons! 1. The weather is frightful (snowy and freezing). Being in Florida, I am used to the flowers and sunshine year round, but lately it has been cold and cloudy! I live in Pa. and it is frigid! No sunshine ,only brisk wind. I need a warm up and fresh flowers would do the trick. i'm in florida, it's been cold for weeks now. a few days ago we had rain and then colder the next day. i need these flowers now to make my day brighter during this long hard winter! I'm in NC. It's freezing cold and there is A LOT of snow for here, which means the stores have no milk, bread, or eggs, and it's easier to stay home and avoid the crazies on the road who don't understand that they need to drive carefully on ice. I could use a nice bouquet of flowers to remind me that there IS life.... somewhere. Okay, so we have no snow. We have no ice (not today anyway). But we really need a little sunshine. You see we're in the great state of Texas, and all these clouds are depressing. I'd love a little ray of sunshine in the mail! It's 22 and snowy here and I could use some flowers to brighten my day. Help...I'm stuck in Michigan, land of cold and snow. When I look outside all I see is white , all around-Please help me help some color and beauty to my world. Here in Minnesota, it's cold and snowy about 9 months out of every year. We get snowstorms that collapse the Metrodome roof, cause hundreds of accidents, and make everything sad and grey. This is why I need flowers. We've had rain,rain,and more rain. Sunflowers would be lovely! In Minnetonka, Minnesota the weather is cold and expected to get colder. We have had about three feet of snow in the past month and our snowblower does not work. Coming in after manually moving all that white stuff, a burst of yellow sunflowers would be lovely to see. It was freezing here last night weather was in the 30's today our high was in the 40s. Its been to cold to garden. Since I will be packing up the Christmas decorations in a couple days,some colorful flowers would be great. I live in Seattle and we are having our typical grey rainy weather which is always rather depressing. I am hoping for some snow soon, to brighten things up a bit. These flowers would brighten up my daily routine for quite a while. Long-lasting and so beautifully fresh.